In this study, we investigate two global climatological data sets; the occurrence rate of Equatorial Spread- F (ESF), associated with equatorial plasma irregularities, at 400 km altitude obtained from CHAMP observations, and the evening equatorial vertical plasma drift, vz, from ROCSAT-1 measurements. First, as retrieved for a solar flux level of F10.7=150, the longitudinal variation of the two independently derived quantities correlates between 84% and 93% in the seasons December solstice, equinox and June solstice. The highest correlation is found for the solstice seasons when vz is integrated over local time around the prereversal enhancement (PRE) and displaced 6 towards east. The integrated vz is a suitable estimate of the ionospheric height at the time just after the PRE and the 6 displacement is consistent with ESF eastward drift during 2 h which is assumed between creation and detection at satellite altitudes. Second, our analyses reveal a global threshold vz which is required to observe ESF at satellite altitudes. This threshold depends linearly on solar flux with correlations of 97%. 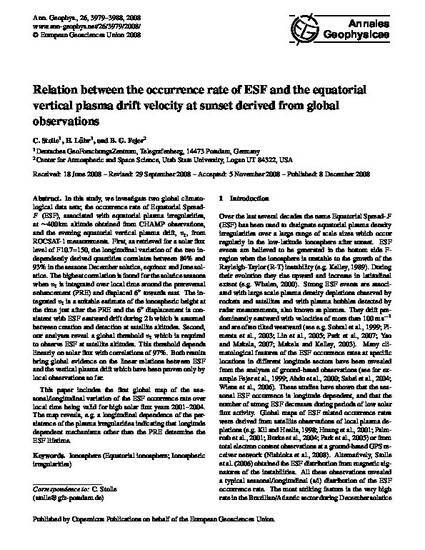 Both results bring global evidence on the linear relations between ESF and the vertical plasma drift which have been proven only by local observations so far. This paper includes the first global map of the seasonal/longitudinal variation of the ESF occurrence rate over local time being valid for high solar flux years 2001–2004. The map reveals, e.g. a longitudinal dependence of the persistence of the plasma irregularities indicating that longitude dependent mechanisms other than the PRE determine the ESF lifetime. Stolle, C., H. Lühr, and B. G. Fejer, Relation between the occurrence rate of ESF and the vertical plasma drift velocity at sunset derived form global observations, Annales Geophys., 26, 3979-3988, 2008.